Rebel troops in Mali have called for calm and said all borders are closed after announcing that they have seized control of the country on state TV. It comes after soldiers said a nationwide curfew was in force and the constitution had been suspended. The troops, who staged a mutiny on Wednesday, say the government is not giving them enough arms to tackle a rebellion by ethnic Tuaregs. West African regional body Ecowas has condemned the actions of the troops. In a statement, it said it had followed the situation with « dismay and mounting concern », describing the behaviour of the mutinous soldiers as « reprehensible » and « misguided ». A government official told the BBC that President Amadou Toumani Toure had been taken to a safe place by his presidential guards, although no further details were provided. A source told the BBC that the foreign minister and a number of other ministers have been arrested by the renegade soldiers. On Wednesday the mutinous troops attacked the presidential palace and traded gunfire with soldiers loyal to the government. The mutineers took over the state radio and TV broadcaster in Bamako and took it off air. After several hours of footage of traditional Malian music and dancing, a group of soldiers appeared on screen early on Thursday morning, with a caption identifying them as the « Committee for the Re-establishment of Democracy and the Restoration of the State ». The leader of the mutiny was revealed to be Capt Amadou Sanogo, who appeared briefly to announce the imposition of a national curfew, although he did not specifying the time. 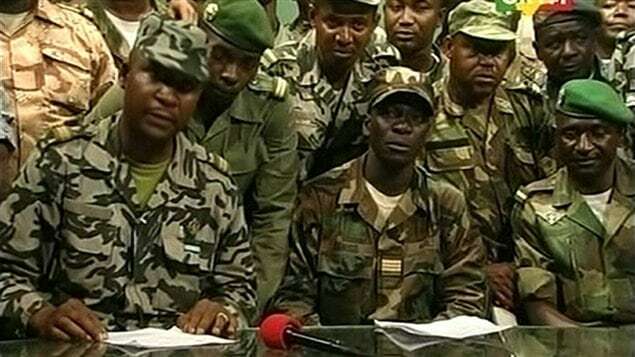 A spokesman for the renegade soldiers, identified on screen as Lt Amadou Konare, said they had ended the « incompetent regime » of President Toure. Lt Konare condemned the « inability » of the government to « fight terrorism », and said the soldiers would look to hand over to a democratically elected government. There was heavy gunfire in Bamako throughout Wednesday and armoured vehicles had moved in to protect the presidential palace, with gunshots ringing out overnight. In a second statement, read on state television on Thursday morning, the renegade troops called on soldiers who took part in the mutiny to stop shooting in the air in order to restore calm in Bamako. They announced that all borders were closed and asked for civil servants to resume activities next week. Meanwhile, in the northern town of Gao, renegade soldiers said they had detained loyalist military chiefs in military barracks, according to the AFP news agency. The BBC’s Martin Vogl, in Bamako, said it was not clear whether the mutinous soldiers have complete control of the presidential palace or have the support of all the Malian forces. Our correspondent said an elite force, known as the Red Berets, could still be loyal to President Toure. He said Mali has had democratic rule for the last 20 years, during which it has come to be seen as a model which other emerging democracies can look to. The unrest began on Wednesday as the country’s defence minister started a tour of military barracks north of the capital. Soldiers fired in the air during the inspection, prompting an immediate strengthening of security around the presidential palace. They were upset with the government’s handling of a Tuareg rebellion in the north of the country, and are also reportedly opposed to any potential talks with the rebels. The Tuaregs have forced the army out of several northern towns in recent months. A presidential election was due to take place in the country in just under a month. The government had so far refused to postpone the poll, despite the unrest involving Tuareg-led rebels. BBC West Africa correspondent Thomas Fessy said if the uprising proves to be successful it could lead the West African state into further insecurity as it struggles to battle the Tuareg-led rebellion and Islamist combatants in its northern desert. Both the US and France have urged the soldiers and government to resolve their dispute through peaceful means. ← Apres les mutineries du Burkina Faso et du Mali la professionnalisation doit etre de mise en Afrique Francophone.